11 essential paragraph and essay exercises for beginner writing students. 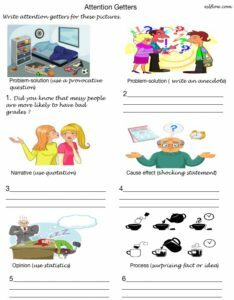 This is a brainstorming and academic essay planning worksheet for students writing essays. 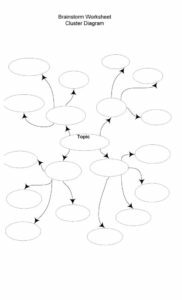 The best way to get ideas for a paragraph or essay is to brainstorm with the aid of a graphic organizer. Students can freely associate ideas to a topic. This allows them to be more creative and explore any path their minds might take. Click on the image or the link to download the PDF file. 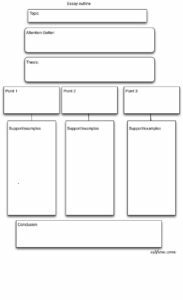 This is a paragraph outline worksheet to help students learn how to write a basic paragraph. 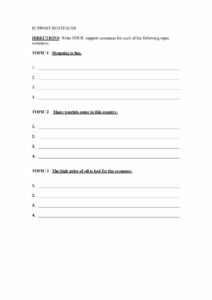 This is an essay outline worksheet to help students focus on organization and planning when preparing to write essays. 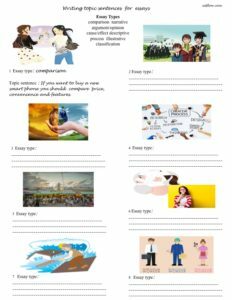 In this worksheet students practice writing main idea sentences by looking at the pictures, and writing an appropriate main idea sentence. They should try to express themselves freely. Topic sentences are essential for summarizing the main idea of an essay. 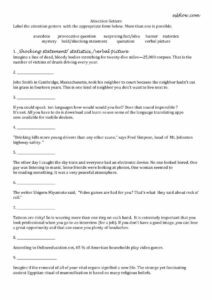 This worksheet can be used to test students’ understanding of topic sentences. 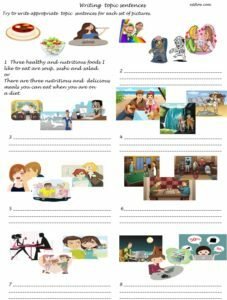 In this worksheet students practice writing topic sentences by looking at the pictures, thinking about what kind of essay each picture might inspire, and writing an appropriate topic sentence. Topic sentences are essential for summarizing the main idea of a paragraph. Paragraphs often have topic sentences supported by three ideas. 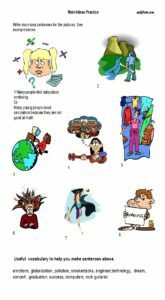 So in this worksheet students practice writing topic sentences by looking at the pictures and trying to summarize three ideas in one topic sentence. Attention getters are essential at the beginning of a paragraph or an essay when you want to attract the reader’s attention. There are many kinds of attention getters but a few of the most common are anecdotes, quotation, provocative questions and surprising facts or statistics. Students can practice attention getters by looking at the pictures and trying to write an attention getter for each one. This worksheet is a good way to challenge students’ knowledge of different types of attention getters. 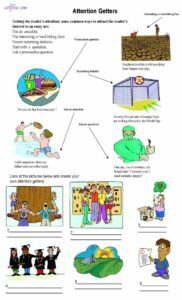 This is another worksheet that tries to impress upon students the importance of good openings or attention getters. 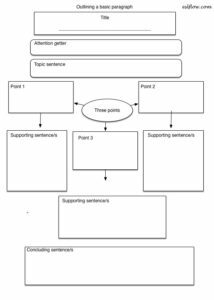 This support sentence writing worksheet can be used to test students’ understanding of both topic and support sentences. Amazing!!! The exercises are completely helpful to me!!!! Thank a lot!